For this session I worked with a couple of Boston Terriers in Omaha; Rudy and Oscar. Their guardian called me in to stop both dogs from getting over excited when guests arrive and their habit of marking in the house. The dogs got so excited when I arrived for the session that they got into a little confrontation with one another. This is called redirected aggression. It usually takes place when a dog is reacting in an intense way to a stimulus that is not able to reach. The dog ends up taking out it’s frustrations on something nearby in this case, Rudy. While I generally advise my clients to avoid picking a dog up when it is misbehaving, sometimes you have to do what you have to do when dogs are having a fight. Although, after reviewing this incident on video along with other dust-ups that occurred during the session, it appears that this was mostly for show and not real aggression. That said, the dogs were so wound up due to my arrival that they had problems settling themselves down. After they got into it with one another a few additional times, I pulled out leashes to block them from interacting with one another and help them calm down. Once the dogs had finally returned to a balanced state, I started asking questions about their daily routine as well as how the humans interacted with the dogs. While we were having this discussion, I noticed both dogs pawing, climbing up on or nudging at their guardians for attention. When you have a dog that thinks they can tell the human what to do, and the human complies with the request, it can give the dog the impression that it is in a leadership position or a peer to the human. When a dog has this perception of authority, they often do not listen when they are corrected and only comply with commands when they feel like it. Because both dogs were exhibiting this behavior to one extent or another, it’s a safe bet to assume that both dogs felt that they had the same authority as the humans in the home. Because two dogs both thought they had the same position of authority, they were starting to mark on objects in the home in order to claim territory or possession of said objects. I have found the best way to stop this behavior is to change the dog’s mindset so that it identifies as being in a follower position. I made a few suggestions of some rules and boundaries that the guardians can incorporate to help the dogs start to identify as being in the follower position. Another great way to help the dogs learn to adopt a follower mindset is to practice what I call Petting with a purpose. The more that the guardians correct the dogs with good timing when they violate the new rules, and make the dogs earn their attention through obedience, the less the dogs will feel it is OK to behave as they have been. Now that both dogs had returned to a completely calm and balanced state, I inquired as to the amount of exercise that they were getting. 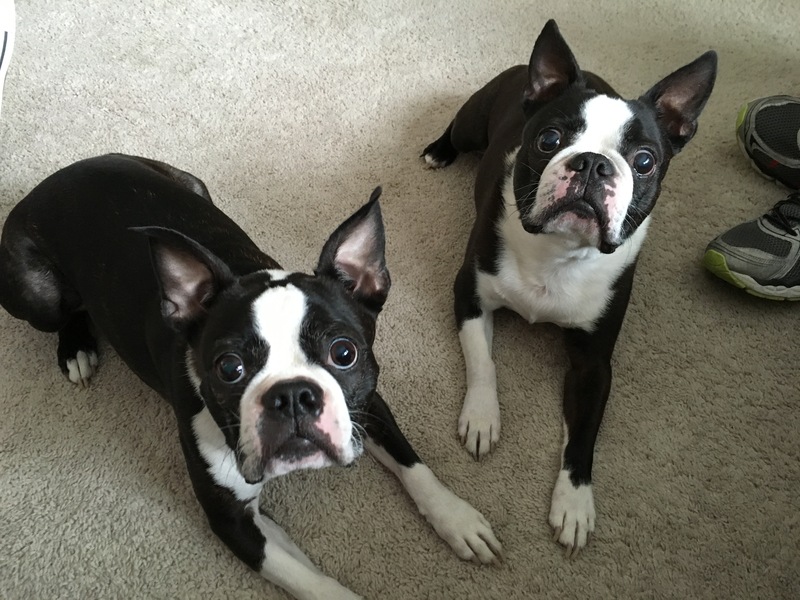 Some breeds of dogs are higher energy than others and Boston Terriers are certainly on the higher end of the spectrum. The dog’s behavior on walks was so unruly that the guardians had stopped trying to walk them together a long time ago. I showed them how to get their dogs leashed up while remaining in a calm and balanced state. Many people rush through this process and end up with a dog that is extremely excited before they even get to the door. But the energy your dog has when you put the leash on is the same energy they will typically carry throughout the walk. I fitted both dogs up with a Martingale collar, added the special twist to the leash and then went over the rules that I use when taking dogs out for a structured walk. I took the leash first and demonstrated how to properly position and correct the dog when it got out of position as well as how do rewarded for doing what we wanted. Once I finished showing the technique, I handed one of the dog’s leashes to the family’s mother and coached her through the technique while she walked with Oscar. Indeed they do. And a moment later the mother was walking both dogs in a nice calm fashion while they remained in the heel position needing few corrections. After a short walk, we returned to the home so that I could coach the family’s father through the same exercise. I chuckled a bit out loud when he said “oh boy” as I handed him the leashes. But just like his wife, the Martingale’s provided great control and because we took the time to settle the dogs energy and behavior before leaving the house, they were easy to control and lead on the walk. Even when we encountered a puppy on the walk, the guardian was able to get the dogs to stay calm and not react in a negative way. Now that we had provided the dogs with the rules and structure that they needed, and they were seeing their humans as authority figures, we were ready to repeat the door answering exercise. Things started off a little bit shaky as the guardian’s timing and technique were off. Her hesitancy in her movements as well as stopping short or stomping rather than walking briskly towards (or through) the dogs created a few bumps in the road. But once she remembered to keep her hips squarely facing the dog, and her focus improved, well the results speak for themselves. I suggested that the guardians text or phone one another when they are on the way home so that the other spouse can practice answering the door in this same way. If they consistently practice this exercise daily for the next week or so, the dogs should learn to remain calm and behind the boundary on their own with minimal corrections needed. By the end of the session, the dog’s energy had moved to a calm and balanced state. They were no longer invading the personal space of the humans, stopped pawing at them for attention and had not reacted to one another with any redirected aggression. Rudy and Oscar are not bad dogs, they simply didn’t understand their place in the family. Now that the guardians know how to incorporate rules boundaries and structure, the dogs will start to see and identify themselves as being in a follower position. Instead of demanding things they will learn to ask for them and accept the possibility that they may not always get what they want.